What’s it like managing comms for a global event that brings together over 500 people from 52 countries – and doing it solo? 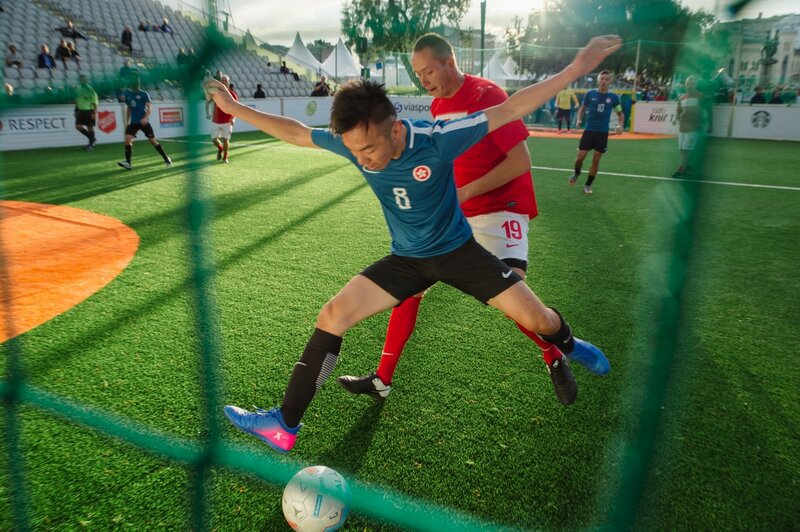 I spoke to Mariana Mercado about the highs, the goals and tackling challenges of heading a team of volunteers at the Homeless World Cup, an annual international football tournament for people who are or have been homeless. Why football? How can the game help to tackle homelessness? When you become homeless you lose access to so many important things – like social relationships and even having leisure time. While it can be difficult to motivate people to take part in something formalised, like a job interview or rehabilitation, it’s much easier to get them to come and join a football game. During a game, everyone is equal, they conform to the same rules. It doesn’t matter if you have a job or a house, or if you suffer from substance abuse, you can still join in. Football is the tool used to reach out to more people, without adding any of the pressures to ‘improve your life’. That comes after. What are your key aims for communications during the event? The aim of the tournament is two-fold. It highlights and celebrates the work our global partners, street football programmes, do on the ground. It’s an aspirational opportunity for their players to compete in the Homeless World Cup. But it’s also about changing perceptions of homelessness. A lot of people have a stereotype of what a homeless person should look like. Our event challenges that. A player is not being portrayed as ‘a homeless person’ during the tournament. They are a footballer and they’re representing their country at an international level. We change perspectives by putting the person first. Stats from last year’s event in Glasgow showed that 84% of spectators said they had a more positive attitude towards homeless people from watching the tournament. You have hundreds of people from all over the world taking part, each with a fascinating story. Is it difficult to choose which ones to share? This is a difficult challenge. We have very little information about the players before they arrive and it’s all confidential. So, you have to start from scratch finding stories when the tournament begins. Getting a well-rounded story, that changes people’s perceptions of homelessness, with very limited time and resources is tough. When people are vulnerable, they may not want to share things immediately about being abused or sleeping rough. Building that trust, which is a privilege, takes a bit of work. You’re also competing for their time with their training and match schedules – they’re there to play football. You have the language barrier to contend with as well. Plus, you want to make sure they have a positive experience of the interview, to leave on a high. Sometimes players change their minds about sharing their stories. They don’t want prospective employers finding out about them having been homeless. As much as we’re trying to change perceptions, our duty of care goes first and foremost to the players. The comms team at the event are all volunteers. How does this impact what you do? I find our volunteers, especially when they’re students, very open and you get a lot of good will. When you’re a new writer, for example, working with really talented photographers or editors can make you want to up your game, and it’s a really good experience. You may possibly lose a bit of the quality, but that really boils down to who you have as your editors, as they can make the content more compelling if they need to. More importantly, we’re a team of four staff members at the Homeless World Cup Foundation. We simply wouldn’t be able to hold the tournament without our volunteers. Any concessions we make are insignificant compared to the benefit and support we’re getting from the volunteers. When the event started 15 years ago, there wasn’t social media to consider. What advantages or challenges has it brought to the event? As the Homeless World Cup has got bigger and bigger, so has our reach. And a lot of that is down to social media. Because of the way people consume stories now, we can do a small post or a video and it just gets devoured. For example, one of our videos had over 41,000 views on Facebook alone. We can do this for very little cost and share it for free. This works for a lot of charities, but it also means there’s a lot of charities to compete with. Social media is a difficult topic though – it keeps changing so fast, especially the way we measure and report on it. We started live streaming the matches last year and that brought in a lot of traffic. UNILAD and football site Copa90 share our content to millions and that might translate at some point into some donations, which is what we’re after. If you told the organisers back when we started in 2003 that you could have this reach with almost no cost, they wouldn’t have believed it. What advice would you give to anyone involved in comms at a large international event? Be flexible. We’re so used to working to schedules in comms, but in a case like this you can’t be precious, you have to be prepared to change your plan or move your deadline. Ultimately, in sporting events, comms is the most important and the least important thing there is. In terms of delivery, you’re not essential to the event. However, it’s essential you’re there to report on it – or there won’t be an event next time. That’s why comms people are often the first up and the last to go bed!